Senior Friendfinder is for people in their 50, 60's and beyond. The site attracts around 35,000 users most of whom are seeking companionship and romance. While it's possible to use the site for at no cost, communication with other members is limited until a subscription is purchased. Membership starts at $22.94 per month. Senior FriendFinder is for anyone who's old but certainly isn't "over the hill". People join looking for romantic relationships as well as new friends, travel companions, or in some cases, just pen-pals. The mature folks listed there may have been married previously, widowed or never been married. The only difference is their age and or the age of those they are seeking. Reading the postings of other members is a good way to get a feel for the site. On registering you'll need to create a basic personal profile, and enter a few details about yourself - just enough to get started. This will gain you access into the members' area, and enables you to start browsing for others matching your preferences. As long as you create a respectable profile and put up a flattering photo or two, you can expect to get some good responses from people there. Friendfinder's large and connected network ensures enough people to make joining worthwhile, and find compatible matches. As with other FriendFinder sites there's an excellent range of features that make finding and making new friends easy. The profiles appearing are some of the most in-depth around. Standard members can't access the detailed options on the search forms and can only reply to emails. You can't initiate contact with anyone other than sending flirts - unless that person happens to have paid for the privilege of letting free members communicate with them. The only way around this of course is to subscribe to one of their packages. If you have a hobby or special interest that you're passionate about, the profile search lets you find people who may share your interest. There's a wide choice of hobby categories, ranging from gardening to skiing. As a free, standard member you will have access to advice articles and the site's magazine. If you choose to upgrade to the Gold package, you can then enjoy access to other features such as video greetings, unlimited profile pictures, hot list storage capacity, etc. Paid members also have the option to create their own personalized blogs. You don't need to be a member to browse though these blogs. Some of them are quite entertaining and informative. Reading the opinions of other members is a good way to get a feel for what is going on there and the types of people you're likely to meet. Rss Feeds. Subscribe to comments for this site. [?] Receive updates about Seniorfriendfinder.com directly through your newsreader. i am a man of 35 and i am looking for a woman that can make me be a man. I just like to find some one I could talk to that's all. It is for mature singles in their 40s, 50s, 60s and older. Young mature woman seeking companionship. i would like to meet mature women. Like to know more about this site and people. Like to find some one I could talk. I am searching women 25 to 45 age for dating. Plz contact me i am really waiting. Would like to meet an older adult, male of female who likes to travel, go places go to movies, theatre concerts. Has college background is retired & loves music. 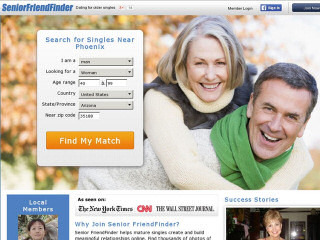 Senior Friendfinder 3.53 19 A review of Senior Friendfinder. Senior Friendfinder is for people in their 50, 60's and beyond. The site attracts around 35,000 users most of whom are seeking companionship and romance.